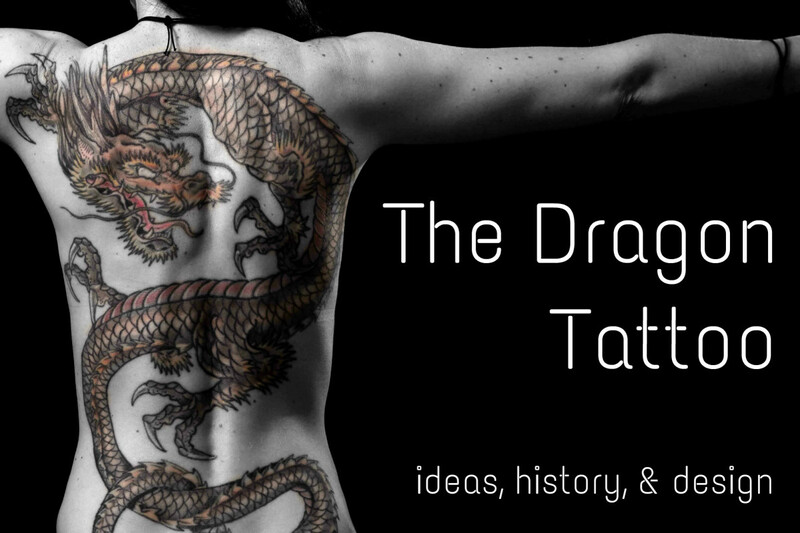 Because The Lord of the Rings is probably my favorite story of all time, and one of my favorite movies, I wanted to check out what types of tattoos there would be out there in connection to the franchise. 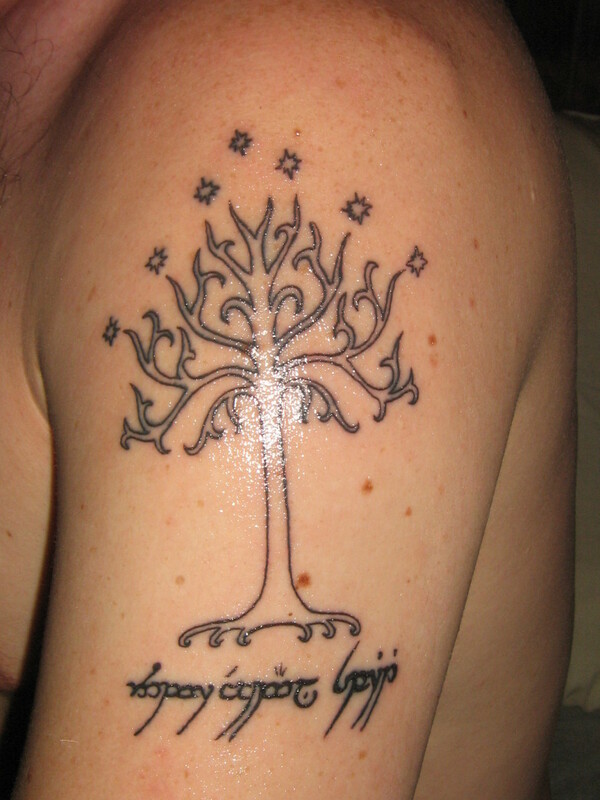 What surprised me was there weren't as many as I thought there would be, and the most popular tattoo I found from the series was the elven script called Quenya, which was a fictional language of the high-elves of the J.R.R. Tolkien universe. The script created was so stunningly beautiful that many consider it an art form in itself. 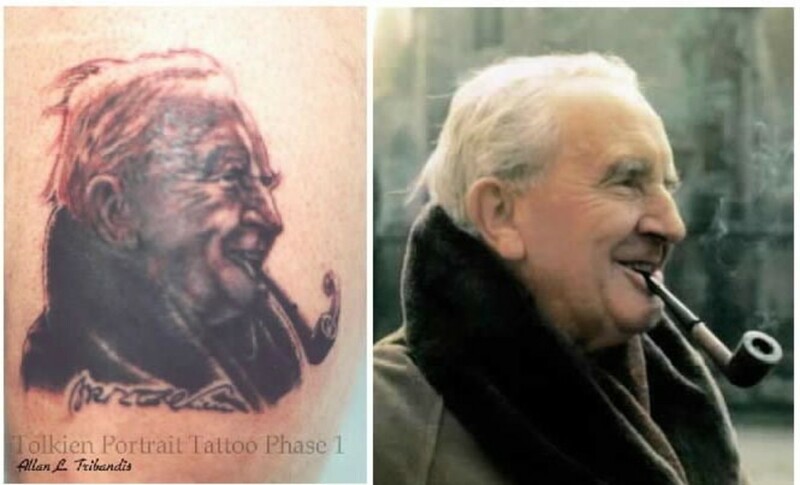 This is probably the reason it's the most popular Lord of the Rings tattoo (my unofficial observation). I included a musical interpretation of Into the West by someone translating it into 'Quenya,' in case you've never heard it before. Pretty well done! Lord of the Rings fans are just like any other fans, they're committed and have been for decades in some cases. And those that were exposed to the story for the first time in the film version of the story quickly became rabid fans as well. 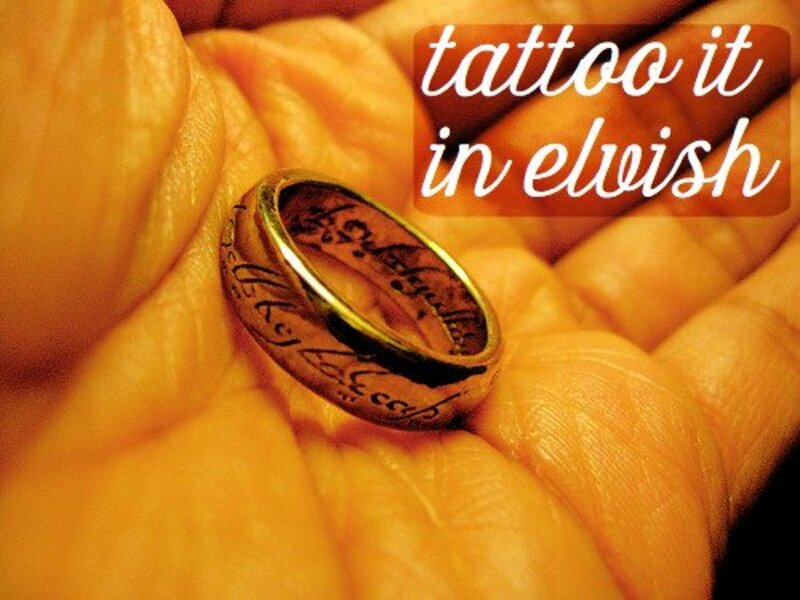 So tattoo designs associated with The Lord of the Rings for fans are more than just tattoos, they're part of the legend and lore of a story that will remain popular far into the future. The fans will make sure that's the case without a doubt. 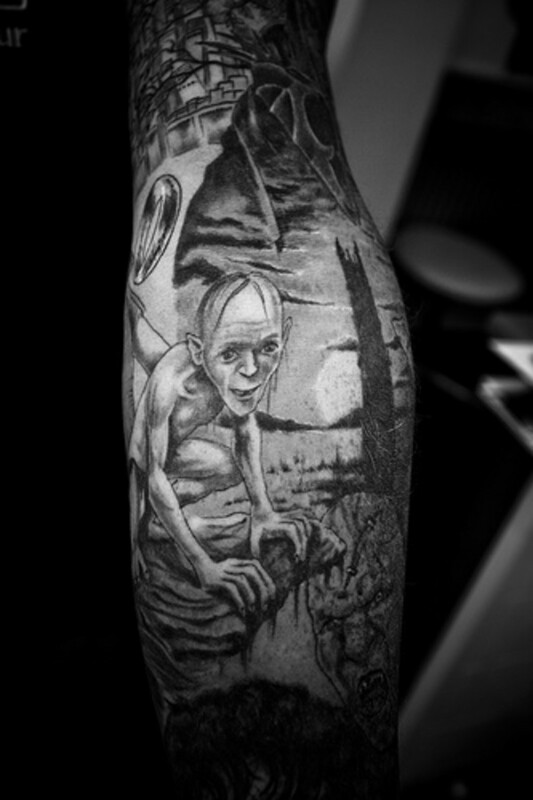 This tattoo of Gollum really captures the way he was portrayed in the film version of Lord of the Rings. Other than his eyes possibly being a little too friendly (although there was a brief time when that was true), I think it's a great likeness and interpretation of him. The tower with the moon behind it in the background looks awesome. J.R.R. Tolkien was the creative genius behind the Lord of the Rings world, language, and mythology. It's fitting to see this tattoo made in his likeness. 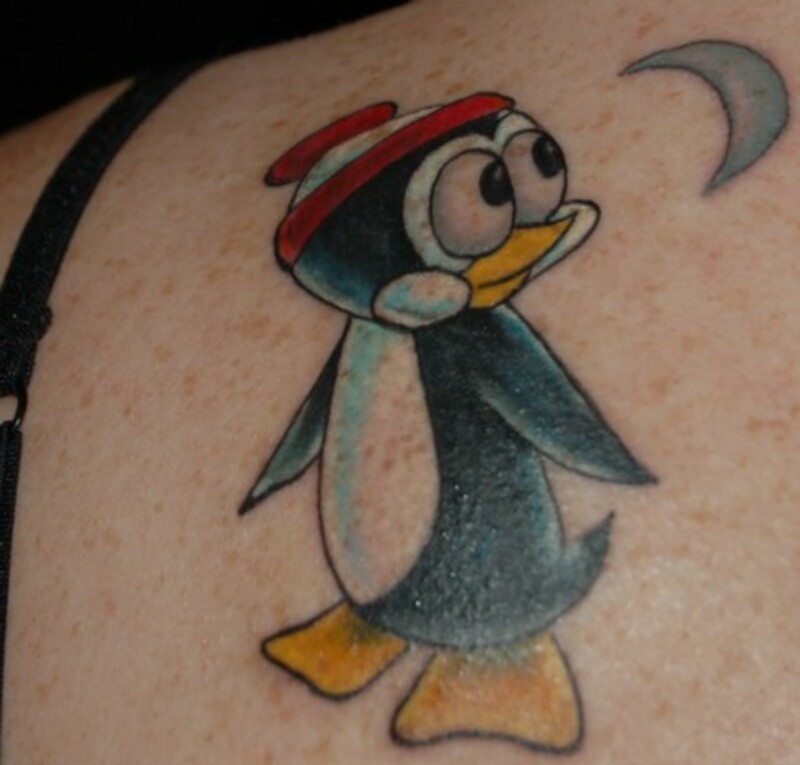 Pretty unusual in that most tattoos are of the characters created by authors, not the author himself. This one is of possibly the most recognizable photo of Tolkien smoking his pipe. 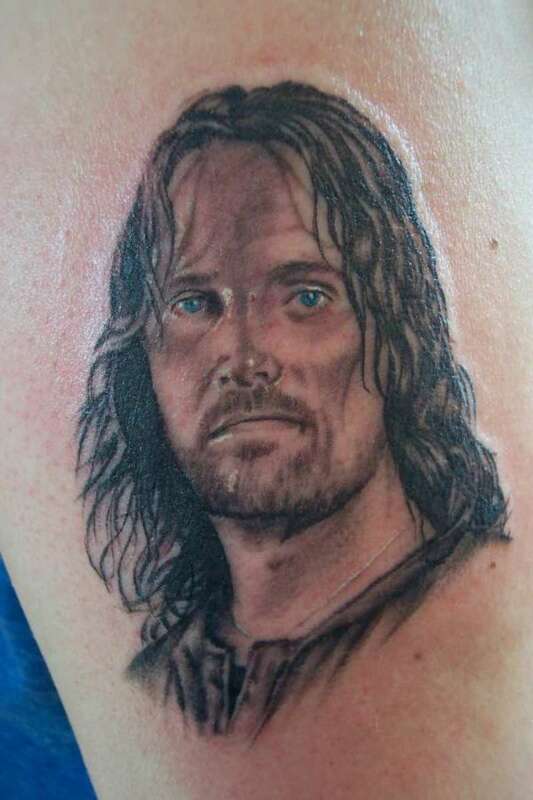 The likeness of Aragorn is about as good as you can get with a tattoo, and captures almost exactly who he was and what he represented, along with actor Viggo Mortenson. I like how the shadowing on the face gives the sense of the weight that Aragorn always bore up until he finally decided to become the man he was meant to be, as the Elven king exhorted him to be. 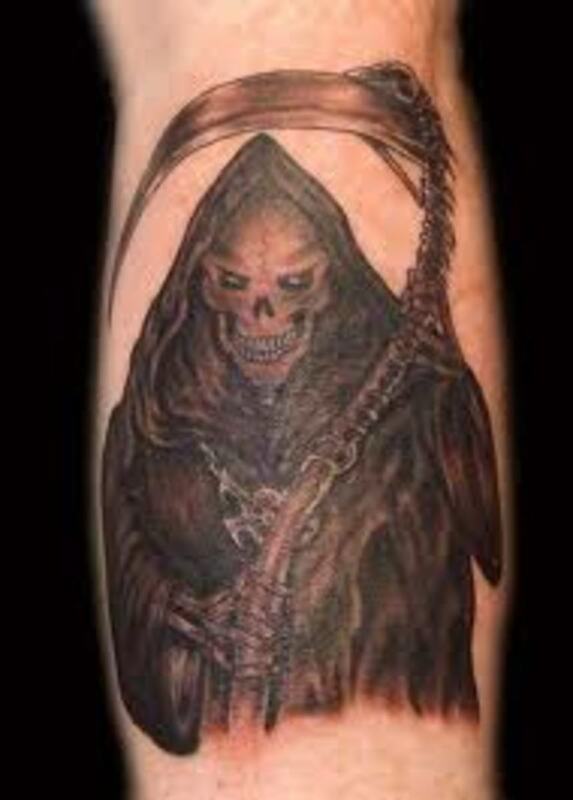 I really like this Nazgul tattoo, which was one of the major characters on the side of the shadow in the story. The body and wings of the creature he's riding look great, and the inclusion of the rider adds a sense of the deadly combination that searched for and sought to destroy the Hobbit heroes in the battle between good and evil. They are probably among the more memorable bad guys in film history. Hey, this isn't any old orc, this guy is recognizable, and done very well by the tattoo designer and artist. 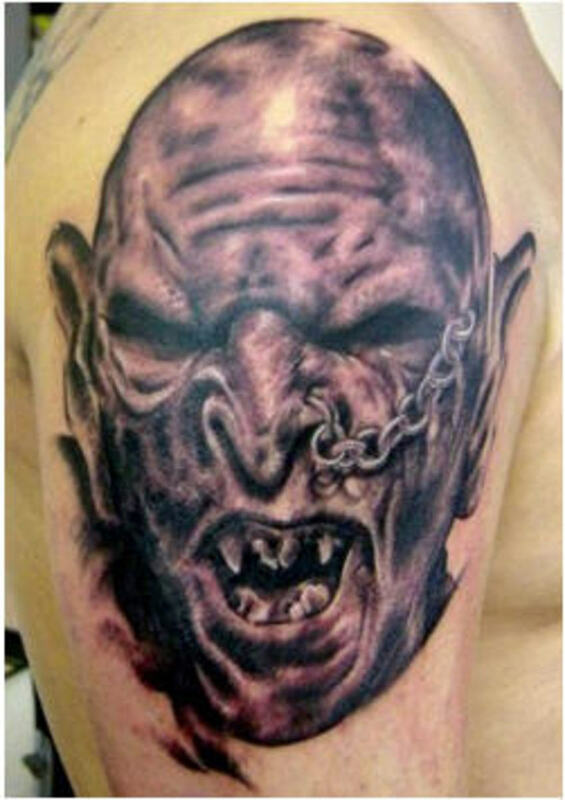 If you're looking for an orc tattoo from Lord of the Rings, this guy would be tough to beat. The detail on the face of the orc is extraordinary, conveying the pure evil and hatred inhabiting their dark hearts. Of all the many important lines and saying in Lord of the Rings, this may be the one most remembered and liked by fans. 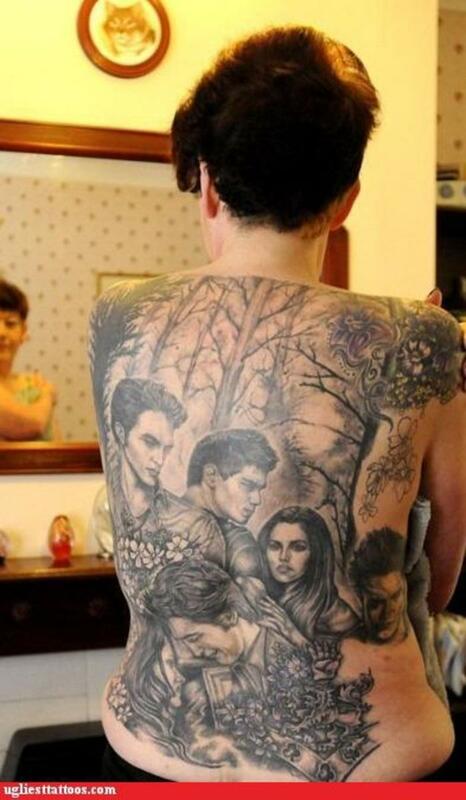 Very cool that someone had it tattooed in this form. 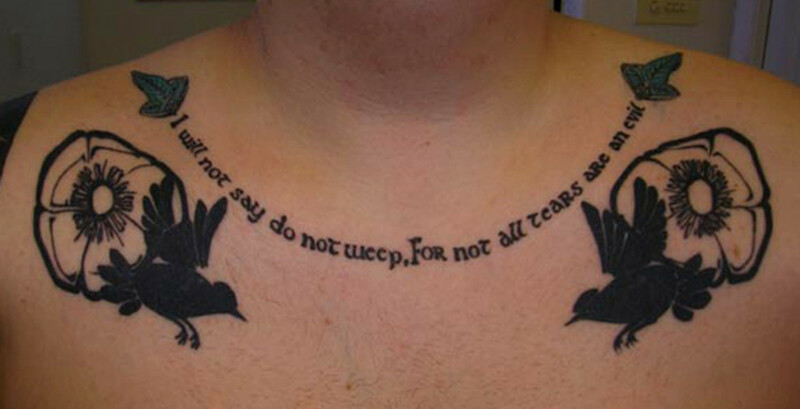 It says, "I will not say do not weep. For not all tears are an evil." 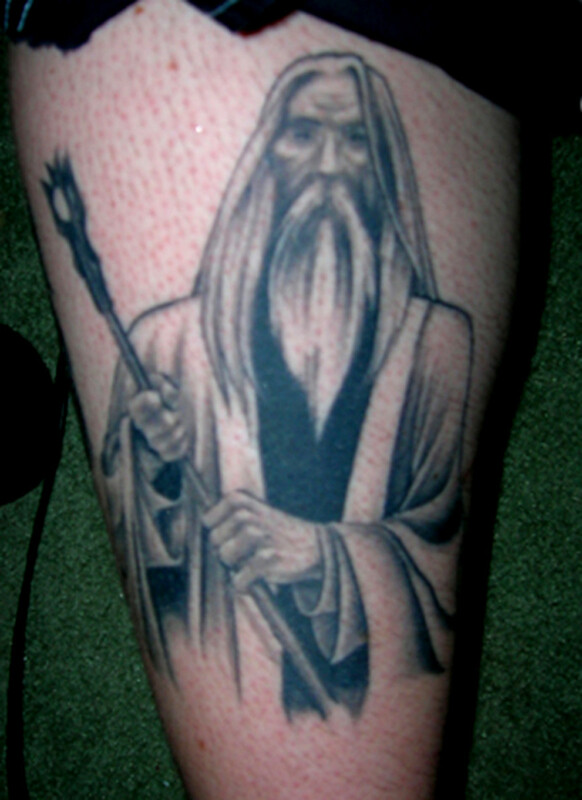 There are some really good tattoo artists working on the Lord of the Rings tattoos, and here Saruman is captured fantastically. Saruman became the arch-nemesis of Gandalf and the fellowship of the ring before his demise in the film. In the book, he was finally defeated much later. As Gandalf once said about himself, he had become what Saruman was meant to have become. Maybe this was a time before he turned to the shadow. 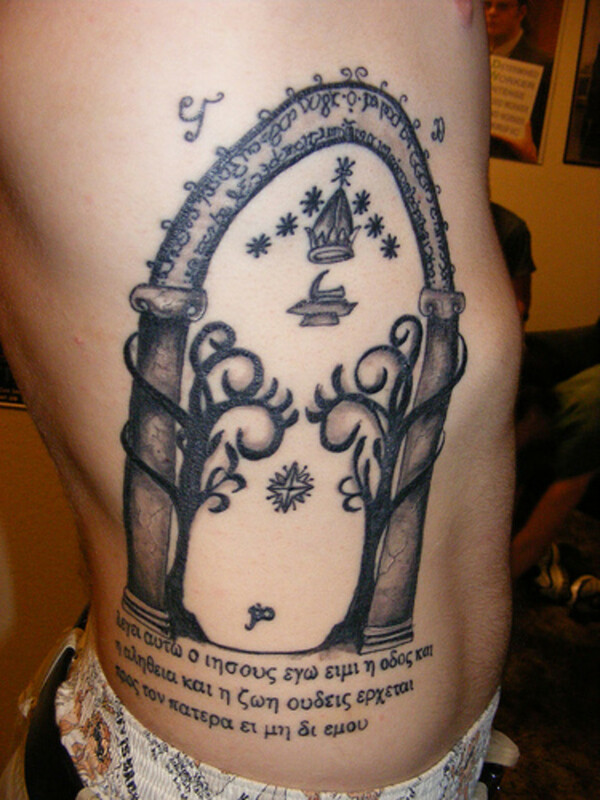 I really like this Mines of Moria tattoo, but I wonder what's up with the Greek words below. Too bad the decision to show the lettering lit up like in the movie wasn't made, as I think it would moved it from a good tattoo to a great one. 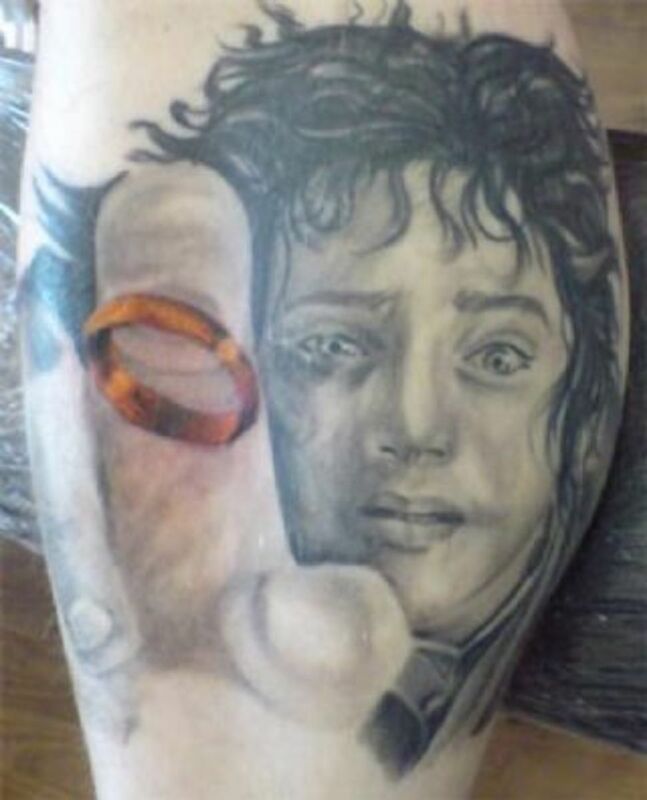 But still a nice tattoo design depicting one of the crucial moments associated with the Lord of the Rings film. This is a must-have tattoo for looking at a Lord of the Rings tattoo gallery, as it's one of the more important events in the entire story. It's really effective how the artist brought the gold of the ring out on the black and white background. The almost invisibility of the hand in the front is also very powerful. Tremendous tattoo. 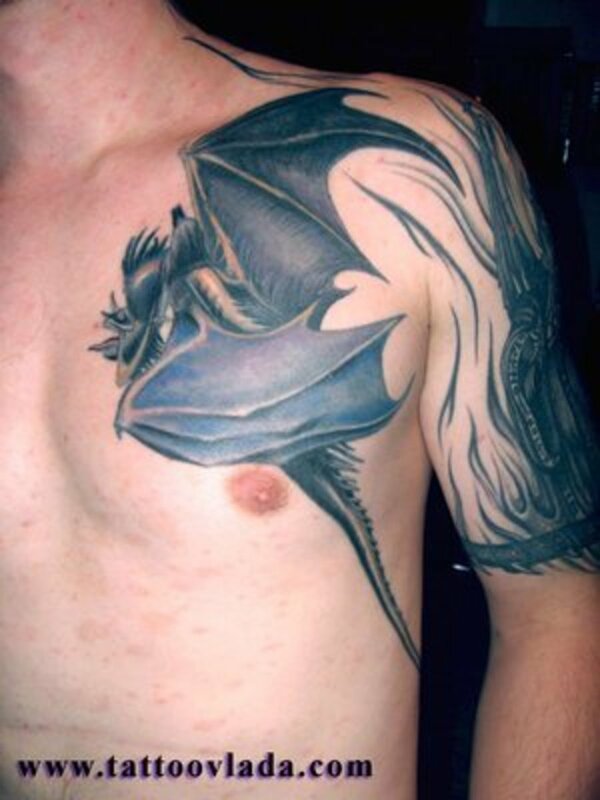 I was very impressed with this collection and gallery of Lord of the Rings tattoos. Being a huge fan myself, I'm sure some of my personal bias came through. But by any measurement, these are really good tattoos, and it doesn't even come close to revealing the large number of characters in the film and book series. is there a meaning of the Elven script under the tree? I would be happy if you know the meaning and answer. Hi there your is a good hub, it was interesting reading. Aragorn looks like hes having a stroke. some of the work here is amazing. 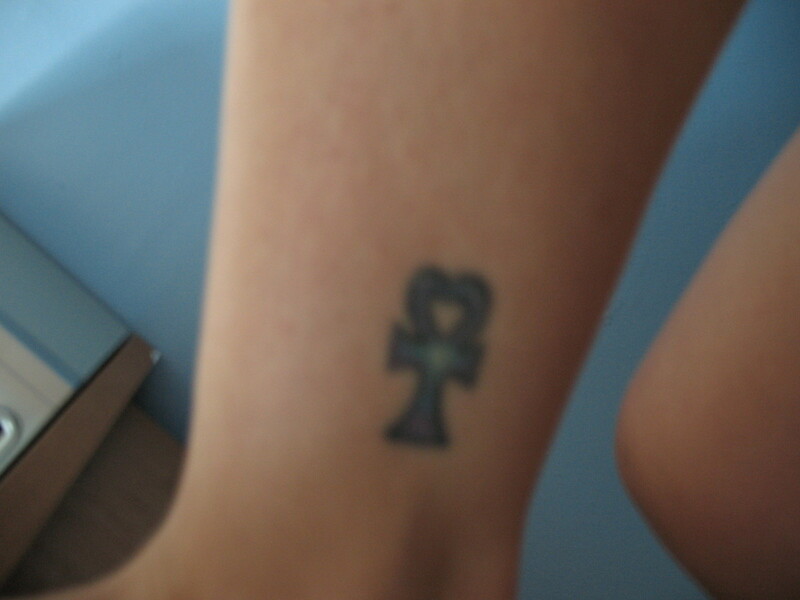 I have two LOTR pieces, one was actually put on my arm about a week ago. Ive got a picture of one of them on my facebook and the other will have a picture up soon. Wow these tattoos are amazing! They make me really excited to get my sleaze done because it's going to be completely lord of the Rings themed! Wow the first picture is the tattoo i'm getting! Excellent Hub to! Those are extraordinary tattoos, the eyes on Aragorn are uncanny. The song was lovely in Quenya. Thanks for sharing!